The difficult thing about making pancakes is knowing what to do first. As you can see above you might start by heating the griddle or by adding any of the ingredients to the pancake mix. 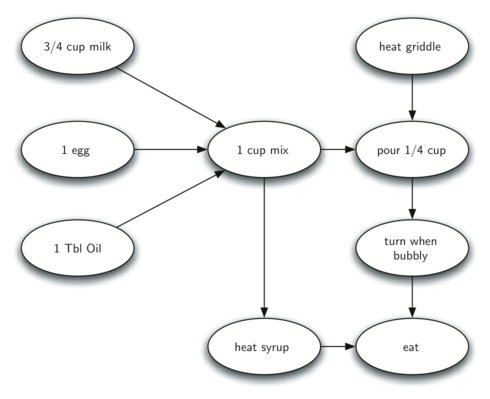 To help us decide the precise order in which we should do each of the steps required to make our pancakes we turn to a graph algorithm called the topological sort. A topological sort takes a directed acyclic graph and produces a linear ordering of all its vertices such that if the graph GGG contains an edge (v,w)(v,w)(v,w) then the vertex vvv comes before the vertex www in the ordering. Directed acyclic graphs are used in many applications to indicate the precedence of events. 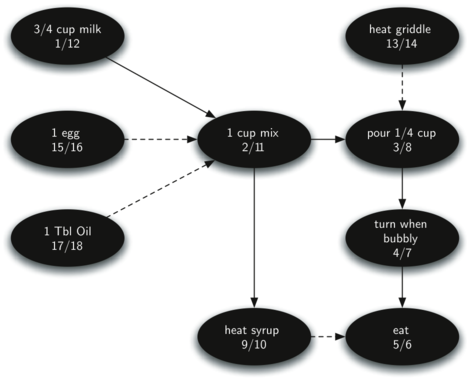 Making pancakes is just one example; other examples include software project schedules, precedence charts for optimizing database queries, and multiplying matrices. Perform a depth first search over the graph in order to compute the finish times for each of the vertices. The diagram below shows the depth first forest constructed by conducting a depth first search on the pancake-making graph shown above. Finally, the diagram below shows the results of applying the topological sort algorithm to our graph. Now all the ambiguity has been removed and we know exactly the order in which to perform the pancake making steps.